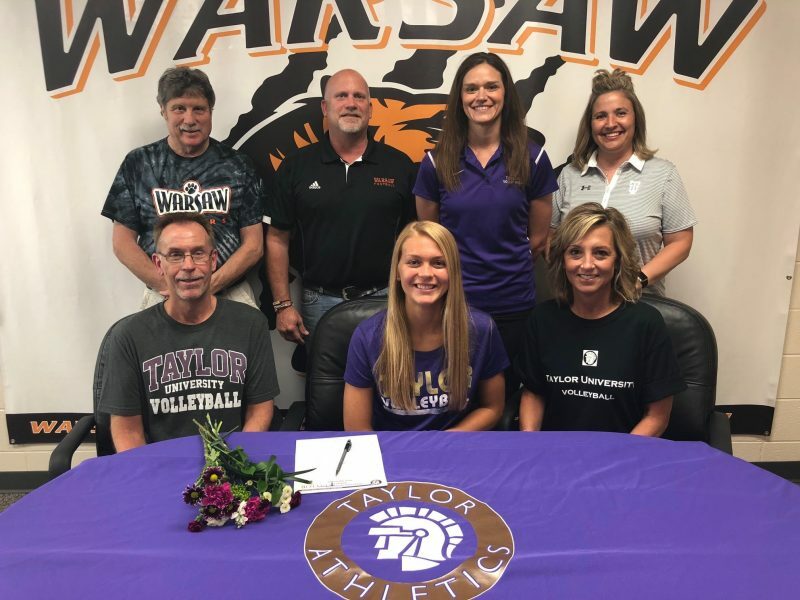 WARSAW – Warsaw junior multi-sport standout Kacy Bragg has provided fans with a number of fantastic bumps and buckets in her three seasons with Tiger Volleyball and Lady Tiger Basketball, and the standout setter has chosen to sign a letter of intent to attend Taylor University in the fall of 2019 and play volleyball. Heading into her senior year, Bragg has lettered all three years in both sports and garnered a number of tremendous awards. The All-Northern Lakes Conference first-team selection both her sophomore and junior seasons, was named captain for coach Rick Ashmore’s Tigers and competed in the North-South Junior All-Star series. She was also selected as the Tiger Tourney MVP, earned the Times Union All-Area Team selection, named the Tiger Spirit Award winner, was a Journal Gazette All-Area Team choice, and she earned an AVCA Phenom invite. On the basketball court, Bragg was chosen to the Ink Free News All-Area team, and she was selected as an all NLC honorable mention choice. Bragg has not only been a standout for her athletic teams, she has made a considerable impact in the school and school community. A member of her youth group and a volunteer for church babysitting, Bragg has served with Feed My Starving Children, the Tiger Student Athletic Board, and she represented WCHS in the Northern Lakes Conference Sportsmanship Summit. A scholar athlete with a 3.85 GPA, Bragg intends to major in communications at Taylor and compete for coach Erin Luthy and the Trojans. Taylor is a member of the NAIA and the Crossroads League.